I use TypeWell Everywhere (V7) in PowerPoint (2010). Sometimes, the first letter of an abbreviation is duplicated when the word expands. For example, j expands to jThe or Jthe. tmw expands to tTomorrow. First, I’ll explain a little about how TypeWell Everywhere expands abbreviations. When you type an abbreviation and then press the Space bar, Everywhere “types” a series of backspaces and then types out the target word in full. This happens “behind the scenes” and virtually instantaneously. So, when you type j followed by Space, Everywhere backspaces over the abbreviation j and replaces it with the. As you may know, Microsoft Office products like PowerPoint, Word, Excel, etc. have auto-correct features to “help” you while you are typing. Sometimes those features use similar behind-the-scenes tricks that interfere with Everywhere. 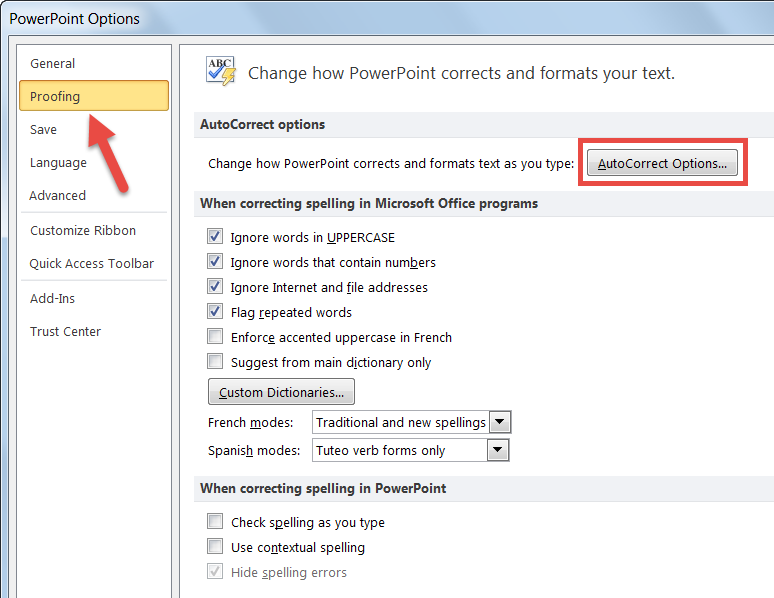 Since the problem you describe only happens with the first letter of each sentence, please try disabling the autocorrect option Capitalize first letter of sentences in your PowerPoint program. Click on the Proofing tab and then the button for AutoCorrect Options. 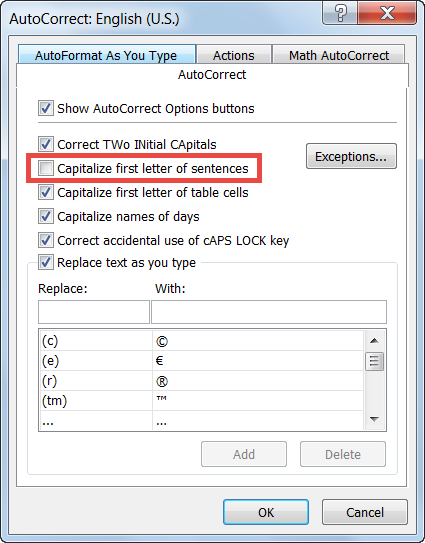 Uncheck the box next to Capitalize first letter of sentences and click OK twice to save that setting. Please let us know whether that resolves the issue. Yes, that seemed to fix it! Thanks so much for the tip! Oddly, when I REchecked that option to auto-capitalize the first letter of sentences, the problem stayed fix (i.e. the letters were no longer getting duplicated). If the problem comes back next time I use PowerPoint, I'll just uncheck that AutoCorrect option and leave it off. I can just auto-capitalize sentences using Shift+Space if and when I need to.